Hello, are you working on update to support 1903? No, not yet. 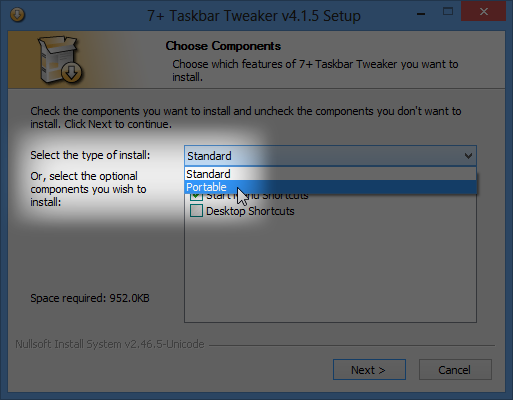 Is there an insider build which breaks compatibility with 7+ Taskbar Tweaker? 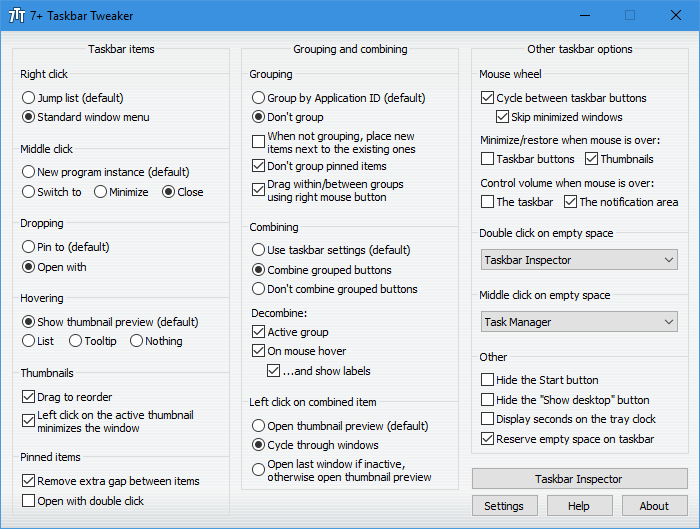 Last time I tried, the tweaker was compatible with the latest insider build. It works just fine. 18362.30 installed. Am using ‘7+TaskbarTweaker’ v5.6.2 using mostly standard setups. Have been having issues with this version of at irregular intervals having issues with starting of my web browser (Mozilla FireFox latest versions) not starting within rite clicking upon the icon and selecting their ‘New private Window’ nothing happens, not all of the time. I use the “Hibernate” feature most often, then again, some times even using the ‘Shut down’ gives issues such as this. Why do you think that it’s caused by 7+ Taskbar Tweaker? Have you tried using your computer without the tweaker running? Is the issue gone when the tweaker is not running? If so, please try to turn off your options one by one and try to find out which option causes the issue. I am not a programmer nor trained user for in-depth work, self-taught as I have been using Computers for a rather lengthy time, about 1974 on a Data General 64bit Main Frame 19″ cabinet type used for troubleshooting printed circuit boars for DOD. Before there were monitors and keyboards using an old TTY for input and output. Just needed a suggestion of where to start for troubleshooting. With your Expertise in creating this software is the very BEST place to start asking questions. I thank you for this, have been using since about the time you first created “7 + Task Tweaker” cannot remember exactly when. This IS the very BEST for keeping a clean clear TASK BAR as we wish, a very large THANK YOU for this. At this time my main concern is SURVIVAL and will make a donation when it gets better, I am retired with a ‘fixed income’ from DOD (Department of Defense) and with the last administration we had attempting to destroy our country of U.S.A. it has been difficult, slowly they are doing some improvements. With the Love Light shinning upon you . . . Thanks a lot for this feature, i’m using it everyday and I love it ! If I may also post here, ‘have been using your software ‘7 + Task Tweaker’ for over 15 years along with “UnChecky” & am very pleased with it and the performance. WORKS GREAT with little issues, if there are any they are corrected very quickly. THANK YOU ! ! ! Why is VirusTotal flagging this with 9 bloody viruses? Never seen anything like that in my whole life, but checking programs like AeroGlass has 0 flags. Can we see the source code for this program? Cant you just take all this malware out and sell the program instead? Noway this is legit. You seem to be checking 5.6.1, which is not the latest version. Anyway, those are false positive detections. 7+ Taskbar Tweaker contains no malware. See the FAQ above and this blog post for more background about false positive detections. Just letting you know there’s a new build (1903/18362.53) on the Release Preview insider branch for Windows 10, so I imagine 1903 will be released fairly soon as a result. When running 5.6.2.2 on 1903, the Tweaker initially hooks into the taskbar (after unsupported build warning, after acceptance the seconds become visible on the clock briefly) and then crashes nearly immediately after. Let me know if I can assist you with making it compatible with 1903 (providing Windows dlls/exes, stacktraces, poking memory, trying bleeding edge builds etc). Many thanks for your efforts in making and supporting this tool! If it loads, can you try to find out which option causes explorer to crash? I’ve just installed Windows 10 v1903 Preview (Build 18362.53) running 7+ Taskbar Tweaker v 5.6.2. 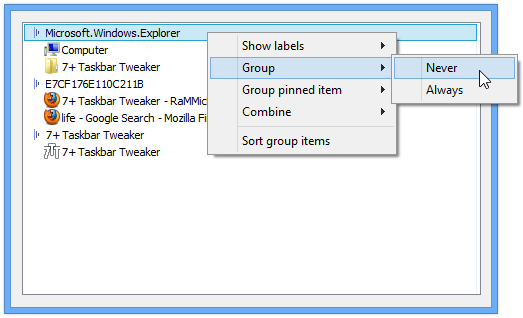 Just to let you know that the ‘large Icons’ and ‘remove extra gap between Taskbar pinned items’ (these are the only options I use) functions are working OK after flagging ‘Windows Insider Version. I just wanted to let you know that I am getting a “Could not load library (5)” error on Win 10 18875. If I can provide any other useful information let me know. Similar error message – after Windows10 installed update and restart. I will probably look at it only when I’m done with version 1903. Hey! I’m on Win 10 17134.706, and I’ve been getting a “Could not load library (107)” error since I updated. Anything I can do about this? Never mind — Just updated to 5.6.2 and it works! Sorry about the false alarm. Thanks a bunch.